InterContinental® Danang Sun Peninsula Resort, Vietnam. Should you wish to take advantage of these exclusive rates offered to World Spa Award attendees from 12-16th September 2015, please click here, then click on the View Room & Rates button. Alternatively you can contact Sukanda Sumondis on the details as below. A three-day programme has been built around the World Spa Awards Gala Ceremony to ensure a weekend of unrivalled networking opportunities and memories that will stay with you for a lifetime! Restore the natural balance of body and mind at the HARNN Heritage Spa. 20% off on spa packages and the special 90 Minute SPA Journey, consisting of a massage and facial especially for World Spa Awards guests. Enjoy the very best of what luxury pedicure and manicure has to offer with PEDI:MANI:Cure Studio. 20% off on all Studio treatments on 12, 13 and 14 September especially for World Spa Awards guests. 9:00am - 13:00 – Complimentary half day tour of Danang - Sponsored by Destination Management Company Oriental Destinations. For more information click here. 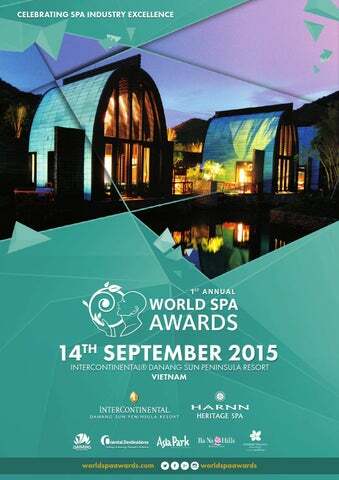 7:00pm – 1st Annual World Spa Awards Gala Ceremony 2015 at the InterContinental Danang Sun Peninsula Resort. Beginning with a cocktail reception, followed by a gala dinner, the much anticipated unveiling of the awards and an after party at the Cheeky Monkey nightclub.